Enjoy your included, one-night stay in Minneapolis. The evening is yours to get self-acquainted with this culturally diverse city steeped in natural beauty. Our Hospitality Desk will be located in the hotel for your convenience between 3:00 PM and 7:00 PM. It is here that our friendly staff can assist with everything from general questions about your upcoming voyage to reserving Premium Shore Excursions. An American Queen Steamboat Company representative, as well as a local representative, will be readily available to provide you with dining, entertainment, and sight-seeing suggestions so that you may maximize your time in Minneapolis. Today is the day you have been waiting for! Prepare to embark on an unforgettable journey on America’s largest and most historical river. If you haven’t gotten your full dose of Minneapolis yet, visit the AQSC Hospitality Desk (Open at 8:30 AM!) for ideas about how to spend your day. The official Voyage Check-In will be open from 9:00 AM to 12:00 PM. During this fast and easy procedure, our representatives will arrange your transfer to the vessel and answer any questions you might have. The process is simple and will have you back to exploring in no time, and, if you think of any more questions, the Hospitality Desk will be at your service until 3:00 PM, when the complimentary boat transfers will begin. It’s time to begin a luxurious voyage down the Mississippi River, where memories will be made that will last a lifetime! The Red Wing Marine Museum is in one of the city’s historical venues along the river near boathouse village and depicts one of the oldest manufacturing industries-the boat and motor business. It sits very near the site of the original factory where Red Wing-made boats and motors were made and launched. e museum exhibits include more than 30 restored Red Wing orobred marine engines, outboard motors and a display of fishing tackle, photographs, documents and other river-related items. e significance of the building is such that in 1885, this limestone building was constructed as the Red Wing Waterworks. e plant used steam power to intake water from the Mississippi River, it went through a fourteen-inch cast iron intake pipe, wells and two filters before it was pumped into the street mains and a reservoir atop Sorin’s Bluff (Memorial Park). Seven miles of water mains then distributed water throughout the city. is building was placed on the National Register of Historic Places and received an Award of Merit from the Heritage Preservation Committee in 2014 for the work done to preserve this significantly historic asset in the city. Thank you for cruising with us! We hope that you had a memorable experience and look forward to welcoming you aboard in the future. Enjoy St. Paul at your leisure or consider a Post-Cruise Premium Shore Excursion with airport transfer. 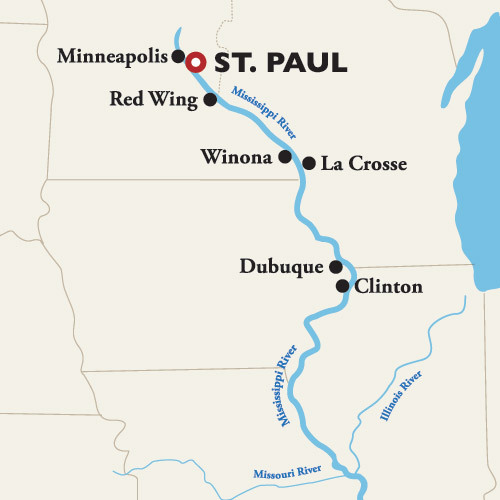 HEARTLAND HERITAGE – This is a timeless voyage that allows passengers to experience the heartland of America traveling the Upper Mississippi River on a beautiful roundtrip voyage from beautiful St. Paul - an area rich with frontier tales of fur traders and pioneers set among picturesque geography and abundant wildlife. Port taxes are not included in the prices shown above.